Most collectors have heard of the Wind Up Walking R2-D2 from Takara but who ever heard of a wind up walking C-3PO large action figure? This figure was obtained from a former Kenner employee and was most likely designed around the release of Empire Strikes Back during the tail end of the short-lived Star Wars large action figure line. 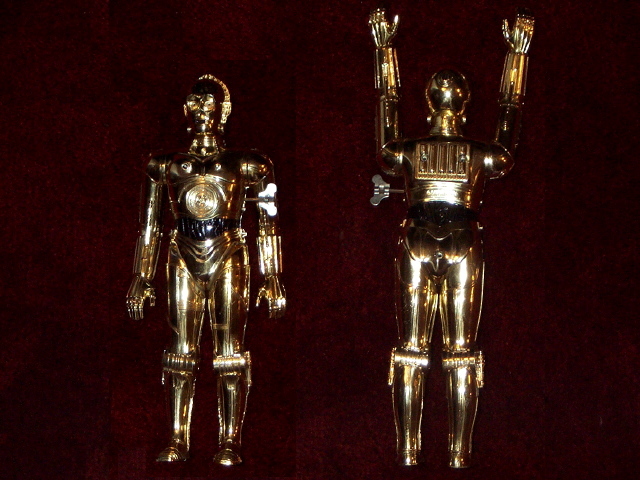 The figure itself is made from a production C-3PO large figure has has been altered internally such that by turning the crank, C-3P0's legs move and the figure (very clumsily) walks across the floor. This probably would have been a very clever way to extend the large action figure line without requiring heavy retooling, but unfortunately many of the unproduced concepts from the Star Wars large action figure line were not pursued because of competition from the small sized action figures.